Steam Boiler Market size in 2018, was valued over USD 15 billion and is set to expand over 3% by 2025. Resurgent economic growth across developing nations driven by increasing investments toward the development & expansion of manufacturing facilities will drive the global market size. Rapidly expanding industries, most notably the food processing & chemical sector will entail he sturdy deployment of these units. Moreover, global financial institutions coupled with respective governments have introduced initiatives to develop new industrial centers which in turn will fuel the product deployment. Introduction of regulations toward emission reduction and energy conservation will stimulate the adoption of high efficiency heating technologies across industrial units which in turn will drive the industry growth. Burgeoning expansion of manufacturing facilities driven by sizeable investments will significantly contribute toward industry expansion. Effective implementation of government regulations toward industrial pollution along with shifting focus toward energy optimization across manufacturing facilities will further augment the industry outlook. <10 MMBtu/hr steam boiler is set to expand over 3% by 2025. Rising investments across the medium & small-scale industries coupled with government initiatives toward local manufacturing will boost the product adoption. Shift in the regulatory landscape to curb carbon foot print along with rising focus on energy optimization will further stimulate the business growth. >250 MMBtu/hr steam boiler in 2018, was valued over USD 900 million. Escalating demand for primary metals and bulk chemicals coupled with increasing investment toward the modernization, renovation and capacity addition of oil refineries will drive the industry growth. Condensing steam boiler is set to witness growth on account of growing concerns over carbon emissions coupled with surging demand for the replacement of existing units. Regulatory measures aimed at energy conservation reinforced by legislative mandates pertaining to energy efficiency requirements will stimulate the product deployment. Non-condensing steam boiler industry is set to grow over 3% by 2025. Increasing demand for refining products coupled with rising investments in the refining capacity additions will stimulate the industry expansion. Key features including low cost, high efficiency and the ability to withstand temperature fluctuations will further accelerate the product penetration. Gas fired steam boiler industry is anticipated to grow over 4% by 2025. Strengthening legislative initiatives aimed at minimizing greenhouse gas emissions coupled with subsequent introduction of stringent regulations toward the adoption of low emission fuels will drive the product penetration across diverse end-uses. Moreover, progressive introduction of energy efficient standards & codes coupled with falling natural gas prices will further complement the industry growth. Stringent government regulations along with shifting focus toward the adoption of sustainable technologies have subdued the demand for coal fired boilers. Moreover, increasing electricity demand, relatively lower cost, easy availability of coal and a lack of regulatory framework in emerging economies will continue to sustain the product penetration over the coming years. Rising demand for petrochemicals coupled with surging investments toward capacity expansion will stimulate the the market growth for refining applications. Growing focus on energy conservation coupled with declining crude oil prices will further favor the deployment of these units. Growing consumer affinity toward processed food along with escalating measures to minimize production costs across these industries will drive the market size for food processing application. Moreover, increasing purchasing power accompanied by changing consumer preferences will boost the industry growth. Asia Pacific market is anticipated to grow over 4% by 2025. Ongoing industrialization along with shift in the regulatory landscape favoring reduced emissions will stimulate the business landscape. Furthermore, growing legislative inclination toward expansion of key economic sectors favored by the participation of financial institutions will support the industry growth. U.S. steam boiler market is set to surpass USD 3 billion by 2025. Increasing demand for processed food on account of changing consumer preferences favored by rising per capita income will enhance the business growth. 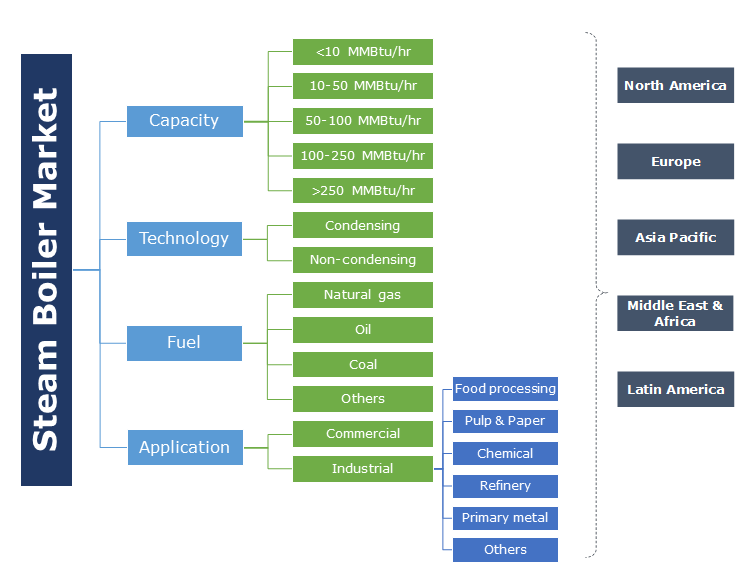 In addition, sizeable expansion in the regional refining capacity along with legislative ventures aimed at optimizing the manufacturing capabilities will favor the industry dynamics. Europe will witness growth on account of the favorable policy framework coupled with rising investments across industrial and commercial sectors in the region. Introduction of rigorous codes & standards focused at carbon emission reduction along with the ongoing retrofits of existing heating systems will boost the industry growth. Progressive replacement of existing boiler units to conform with emission standards will further favor the business outlook. Prominent players operating across the steam boiler industry include Babcock & Wilcox, Fulton Boiler Works, BHEL, Cleaver Brooks, Hurst Boiler & Welding, Clayton, IHI, AMEC Foster Wheeler, Doosan Heavy, Cochran, Mitsubishi Hitachi Power Systems, Forbes Marshall, Siemens, General Electric, Rentech, Miura, Thermax, Viessmann, Hoval, Ferroli, Fondital, Groupe Atlantic, Bosch Thermotechnology and SIME amongst others. New product innovations, overseas business expansions, mergers & acquisitions are some of the strategic ventures undertaken by the industry players. Moreover, the companies are consistently focused toward extensive research & development activities to gain competitive advantage over other participants. A steam boiler may be defined as a closed vessel in which a fluid or water is heated under pressure for steam production. The generated steam is then circulated out of the boiler for various other processes or electricity generation. In case of power generation, steam is expelled out of the boiler at a very high temperature and pressure.